Who would ever guess the smiling vibrant woman on the cover used to be 135 pounds heavier? Andie Mitchell wrote the New York Times bestselling memoir It Was Me All Along, about her weight loss journey. 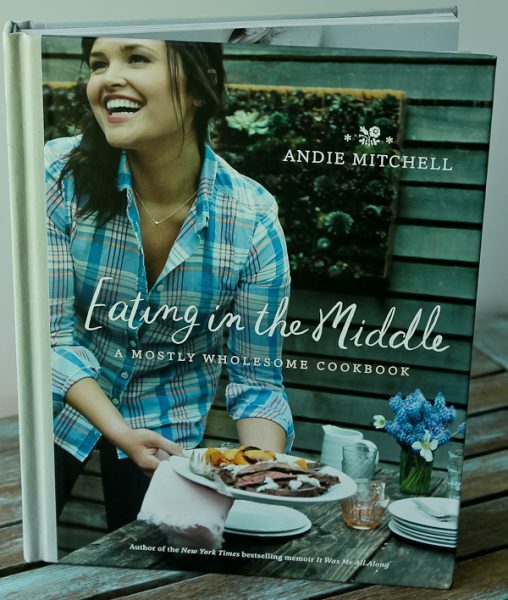 This cookbook, Eating in the Middle, is a follow-up with some of the same encouragement as in her memoir, but filled with recipes to stay healthy yet be able to have an indulgence now and then. In other words, lead a normal eating life, which is a big challenge for so many. The recipes are healthy and wholesome with a few decadent ones thrown in for those special occasions. What Andie learned along her weight loss journey was not deprivation but balance. She learned to “lighten up” favorite recipes but mostly came to learn about herself and her relationship with food through cooking. For Andie, she decided she wanted to have a full life where no food was off the table. She learned to overcome the compulsive cycle of dieting and overdoing it and instead found a middle ground where she could still enjoy all her favorite foods but in moderation. All I can say is, first read her memoir because it is truly fascinating and inspirational, then get this cookbook because it is full of great recipes! In the cookbook you will find breakfast dishes like Greek yogurt pancakes, baked banana bread doughnuts, an omelet with spinach, sun-dried tomatoes, and artichokes, and even a chocolate raspberry breakfast pudding. Lunchtime will bring you baked buffalo chicken egg rolls, a bagel and lox salad, loaded black bean burgers, and a tuna and orzo salad with Parmesan and basil. Dinner will make you swoon with halibut baked in parchment with pistachio mint pesto, a jerk shrimp salad with mango and avocado, lightened-up Pad Thai, or a lemon roasted chicken with Moroccan couscous. There is a chapter called “For Sharing” with recipes for special times with friends and family for meals like baked gnocchi, chicken enchiladas, Cuban pulled pork sandwiches, loaded chorizo nachos, beef stew, or how about meatloaf burgers with bacon, pepper jack, and frizzled onions? For Andie’s special occasion indulgent recipes, you will love the “All Things Sweet Chapter” with items like a peanut butter mousse pie with marshmallow whipped cream, a gooey chocolate chip cookie pie, mini lemon-raspberry cheesecakes, or a chocolate hazelnut bread pudding with a salted peanut butter sauce. I won’t tempt you with the decadent desserts but rather with the chapter on vegetables and sides, sometimes my favorite chapter in cookbooks. I wanted to first make the Greek salsa with feta, kalamata olives, red onion, cucumber, sun-dried tomatoes, mint, olive oil, lemon, and served with Pita chips. Alas, I did not have these ingredients in the house at this moment. I love those flavors! There is also roasted carrots with honey butter, cauliflower with bacon, sesame green beans, a butternut squash salad with kale and pomegranate; but what I had in my kitchen was Brussels sprouts. I love them, so being able to try the coconut curry Brussels sprouts was a no-brainer. I was excited to try them because I have never had Brussels sprouts with coconut before. They are really good. 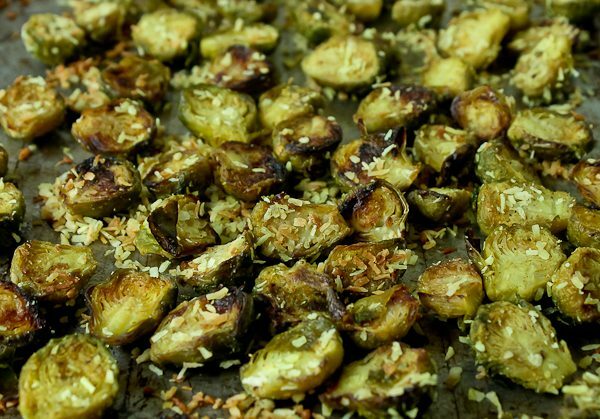 The sprouts are halved and tossed with coconut oil, curry powder, and salt. They are roasted for about 25 minutes, tossed with unsweetened coconut flakes, and returned to the oven for another 5 minutes or so. Easy and so good! Be sure to check out Andie on Instagram, Facebook, Twitter, and Pinterest for more recipes and inspiration! 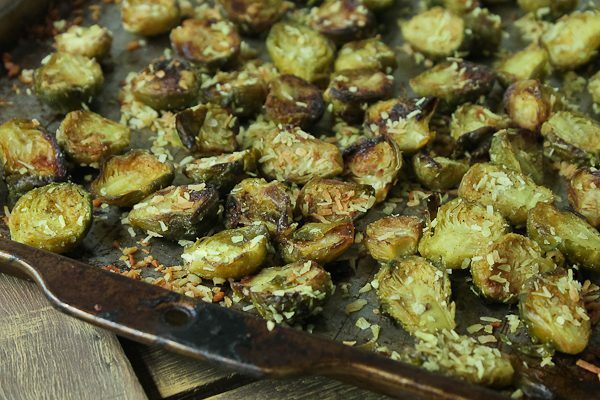 In a large bowl, toss the Brussels sprouts with the coconut oil, curry powder, and salt. 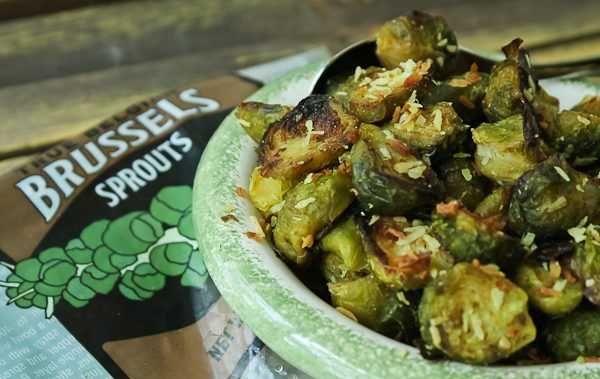 Spread the sprouts on a large rimmed baking sheet lined with aluminum foil, cut sides down, and roast until browned and tender, about 25 minutes. Remove the pan from the oven, add the coconut flakes and stir well. Return the pan to the oven and continue roasting until the coconut is fragrant and beginning to turn a light golden brown, about 5 more minutes. Serve immediately. Serves 4.